← What is it about brilliant color? 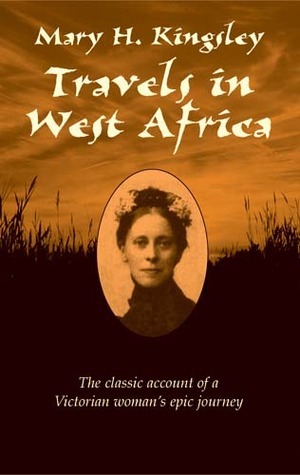 Travels in West Africa, Mary Kingsley (1897), Beacon Press, 736 pp. Imagine this: It’s 1893, you’re 30, female, unmarried, and you have 6 months of free time. What do you do? If you’re Mary Kingsley, niece of novelist Charles Kingsley, you pack up what you need for a lengthy exploration of West Africa (to collect specimens of fresh-water fish) and leave before anyone can stop you. Kingsley, who had had little previous travel experience, discovered her calling on her first trip and couldn’t wait to get back to this continent that fascinated her; the notes from her return in 1894 evolved into her book. 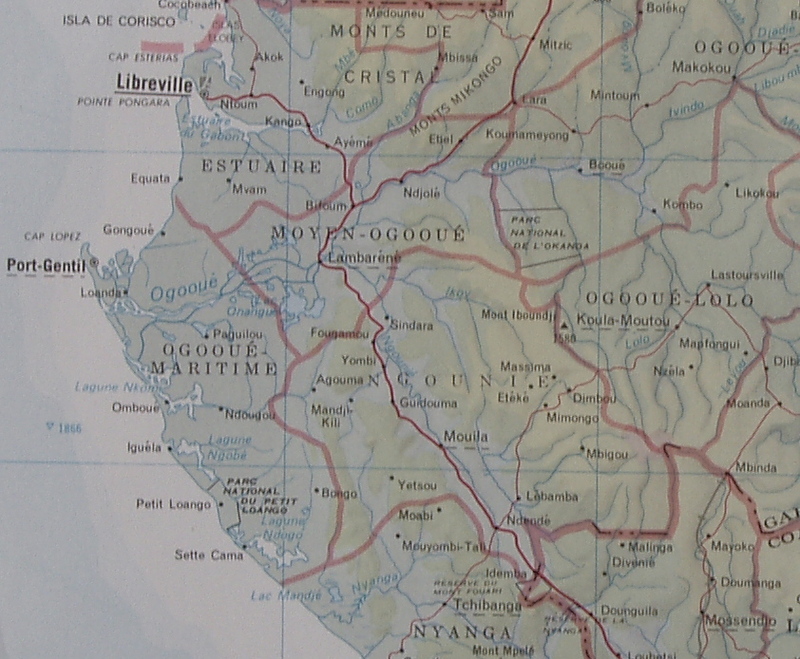 With native guides and only £300, she made her way up the Ogooué River in what is now Gabon (passing Lambaréné, where Albert Schweitzer would build his hospital in 1913), and then hiked overland to another river heading back to Libreville. In many areas, she wasn’t just the first European woman, but the first European the Gabonese had ever seen. And everywhere she went, people asked where her husband was (nearly 80 years later, I got the same question when I taught English in a small Gabonese village). The climbing plants are finer here than I have ever before seen them. They form great veils and curtains between and over the trees …. Sometimes these curtains are decorated with large bell-shaped, bright-colored flowers, sometimes with delicate sprays of white blossoms. This forest is beyond all my expectations of tropical luxuriance and beauty, and it is a thing of another world to the forest of the Upper Calabar [in Nigeria], which, beautiful as it is, is a sad dowdy to this. There you certainly get a great sense of grimness and vastness; here you have an equal grimness and vastness with the addition of superb colour. This forest is a Cleopatra to which Calabar is but a Quaker. Kingsley returned from her two journeys with an unusual point of view: preferring traders to missionaries, she argued in favor of maintaining the indigenous culture (including polygamy) and against Europeanization. She wasn’t anti-Europe; she hadn’t “gone native”. But she had seen what most of the male European explorers and settlers hadn’t: a fully functional way of life, suitable for the conditions under which it had evolved. Once in England, Kingsley refused to ally herself with any feminist causes and never saw herself as a pioneer among women. She never seemed to think she’d done anything extraordinary. The local agents of Hatton & Cookson (they supplied food and materials to Europeans settled in Libreville) reported her habit of saying “It’s only me” whenever she arrived “unheralded out of the bush in a dilapidated state”. 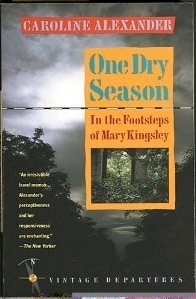 In 1989, Caroline Alexander published One Dry Season: In the Footsteps of Mary Kingsley (Vintage); it’s a lovely footnote to Kingsley’s tome. Read together, the two are an object lesson in history as well as geography. Of course the world has changed in a century, but it’s also surprising how much is still the same. in no particular order: author, teacher, cyclist, world traveler, single parent. oh, and i read. a lot. This entry was posted in Travel book and tagged Caroline Alexander, Mary Kingsley. Bookmark the permalink. Great post, Lizzie! I’ve only read an excerpt from her writings somewhere (probably a Virago compendium) but from what else I’ve read about her she was an extraordinary woman. And you’ve been to Gabon too, I’m in awe! I acquired a TEFL qualification when I was thinking of leaving mainstream teaching but never did anything with it. Just one thing: Mary wasn’t Charles Kingsley’s sister but his niece. She was the daughter of Charles’ doctor brother George Henry and her brother was yet another Charles Kingsley, whom it’s easy to mistake for the novelist. The Kingsleys, like many a middle-class Victorian extended family, were very enterprising, including the women. Kingsley passed on his love of nature to his daughter Rose who became a noted horticulturalist (living up to her name!) and founded a girls school in Leamington Spa, now named after her: http://thekingsleyschool.com/About/Page.aspx?f=History and another daughter, Mary, went on to become a minor novelist herself, even completing one of her father’s unfinished stories. Thanks for the info, Calmgrove. I’ll make the correction. I wonder if we still have families like the Kingsleys, several generations making its mark, whether large or small, on the world. Yes, I thought I’d travel far with my TEFL qualifications, but ended up using them only in Gabon, in the Peace Corps. I’ve been in NYC since. By “mark”, I meant something useful and positive, in science and the arts — something of many colors and great depth. The Murdochs probably don’t make that list — no matter how an analysis may be angled, the Murdochs’ world is little more than shallow yellow press. Yes, sorry, I’m not good at irony. I beg to differ. Your irony was clear, but I wasn’t about to let the Murdochs have the last word! What an interesting life she had! And yet, I’ve never heard of her. Thankfully, my library has Travels in Africa and One Dry Season, so I plan to learn more about her soon. @Juliana: There’s a great story about her falling into an animal pit and being saved from impalement by her voluminous skirts and petticoats. And then carrying on right after being pulled out. I couldn’t have done it. © Lizzie Ross, Writer, and lizzierosswriter.com [2012-2019]. Unauthorized use and/or duplication of this material without express and written permission from this blog’s author and/or owner is strictly prohibited. Excerpts and links may be used, provided that full and clear credit is given to Lizzie Ross, Writer, and to lizzierosswriter[dot]com with appropriate and specific direction to the original content. Musings on Literature. Words about Music. "The world was hers for the reading"
Give me a sentence. I'll write you a story. A love of photography, cycling and exploring places on two wheels. Imagine Classic Literary Characters living in the Modern World. Read Jane Eyre Gets Real, a Novel by Annabelle Troy, available on Amazon! My superpower is being a teacher. What's your superpower?